This month finally saw the release of Harry Potter and the Deathly Hallows Part II, the final movie in the hugely successful Harry Potter movie franchise. Thus the cycle of seven books and 8 movies has been brought to a close. Here we look back at the global phenomenon by setting out some of the facts that have defined it. * J.K. Rowling completed the manuscript of her first Harry Potter story, called "Harry Potter and the Philosopher's Stone," in 1995, having written some of it in local cafes in Edinburgh, Scotland, where she was an unemployed mother living on benefits. * After being turned down by a series of publishers, Barry Cunningham, then of Bloomsbury publishers, signed up Rowling, and the author and company never looked back. Rowling is known as the world's first "billionaire author." * She has sold 400 million copies of her Harry Potter series about the young wizard, his adventures at Hogwarts School of Witchcraft and Wizardry and his battles with the evil Voldemort. * The seven books are called: "Harry Potter and the Philosopher's Stone" (published in 1997 and also as "Harry Potter and the Sorcerer's Stone" in the United States in 1998), "Harry Potter and the Chamber of Secrets" (1998), "Harry Potter and the Prisoner of Azkaban" (1999), "Harry Potter and the Goblet of Fire" (2000), "Harry Potter and the Order of the Phoenix" (2003), "Harry Potter and the Half-Blood Prince" (2005), "Harry Potter and the Deathly Hallows" (2007). * Rowling told U.S. television talk show host Oprah Winfrey in October 2010 that she cried uncontrollably when she finished the last of her best-selling Potter books. * The death of Rowling’s mother from multiple sclerosis significantly influenced her writing, and death is a major theme throughout the Potter series. * Author J. K. Rowling has revealed that Dumbledore is gay, and he had a crush on the wizard Grindelwald, whom he later defeated in a wizard duel. * Harry’s birthday is July 31, 1980. Rowling’s birthday is also July 31—but in 1966. Harry Potter and Rowling share a birthday on July 31st. • Lord Voldemort is trying to find a way to come back and take over the world. * The villain’s name, Voldemort, comes from the French words meaning “fly from death,” and his entire goal is to conquer death. In the second Harry Potter novel, Rowling shows us that “I am Lord Voldemort” is an anagram of “Tom Marvolo Riddle,” which is his actual full name. * Voldemort’s immortality is based on horcruxes. These are magical objects in which Voldemort has hidden part of his soul. As long as the horcruxes are safe, Voldemort can never be killed. The making of a horcrux is black magic as it requires an act of murder to do it. * In the final book, Harry's friends, Hermione Granger and Ron Weasley help Harry fight back against the dark lord who now has control over the Ministry of Magic. They hunt for horcruxes, magical objects containing fragments of Voldemort’s soul. These must be destroyed before Voldemort can be killed. * The Harry Potter movies have so far amassed a worldwide box office tally of nearly $6.4 billion. * The first movie, Harry Potter and the Sorcerer's Stone grossed the most of all the movies so far, with $974.7 million, the eighth biggest box-office takings of all time. * The final movie premiered on July 7, 2011 in Britain and it opened in theatres eight days later. 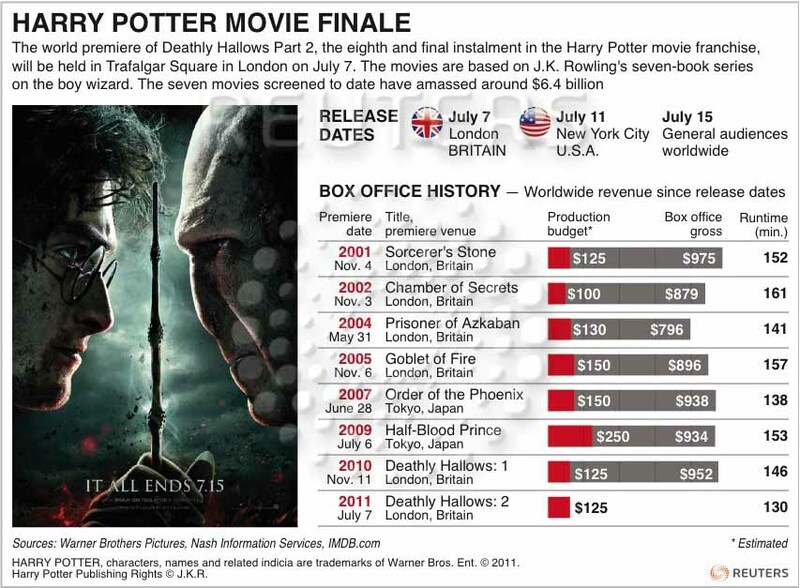 * Harry Potter and the Deathly Hallows: Part 2 has set a new box office record by taking $168m over its opening weekend. The previous opening weekend record was held by Batman film The Dark Knight (2008), which took $158m. * Stuart Craig, the production designer, based his design for the castle, which is Hogwarts school, on a map which J.K. Rowling drew by hand for him. The article has really peaked my interest. I'm going to bookmark your website and keep checking for new details about once per week. I opted in for your RSS feed too.